The Engage project of the Defense Advanced Research Projects Agency (DARPA) was created to encourage interest and learning of young children in STEM areas. CRESST—with DARPA funding—developed the game Go Vector Go to serve as a practical test bed for game design. It is one of a number of games designed to improve students’ understanding of force and motion physics concepts and problem-solving skills. 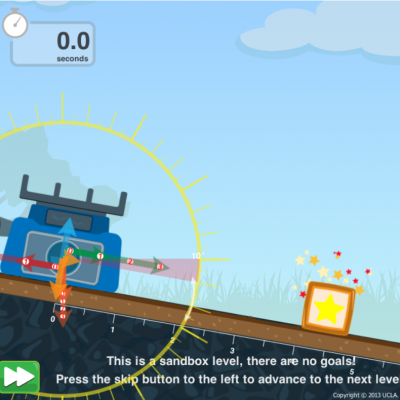 Students are asked to help Vector the Train reach his destination while collecting stars and avoiding obstacles such as dynamite. To help Vector move, students manipulate representations of various physics variables, with an emphasis on force magnitude and direction, mass, under various conditions of slope, friction, and velocity. Students must consider how far Vector is from his destination, determine the potential obstacles that Vector needs to overcome, and judge the speed of Vector before deciding what actions to take. What makes Go Vector Go unique compared to other existing physics puzzlers is the choice to use a free body diagram (FBD) as the main game mechanic. FBDs use vector arrows to depict the magnitude and direction of forces acting on an object. Thousands of students have used the Go Vector Go game.